I don't always read the race info anymore for Disney races, but luckily I did -- the start was 5am, not 6am as we expected. FIVE A.M.!!!!! So we had to get up earlier than we wanted to... but staying so close to the starting line meant we really didn't have to get up until 4, and head out by about 4:20. We had half a bagel each (no time to digest more), got dressed, and headed out. It was surprisingly chilly at 4am - made us wish we had another set of disposable clothes to put on - but we made do with garbage bags. 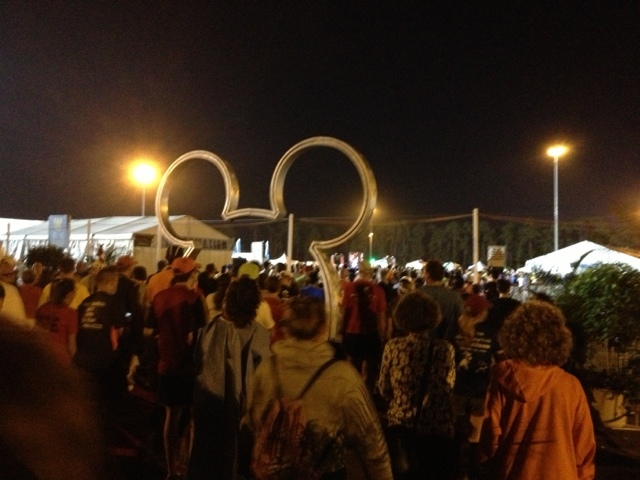 We made our way to the starting area -- across the big plaza, through Downtown Disney, and then a loop behind the Disneyland Hotel to get into the corrals. We didn't really have a plan for this race -- just get through it -- which made it feel like we were waaaaaay more relaxed than our fellow runners. Again, I moved back to corral C so that I could run with Wil - and we didn't have any grumbling about men in the corral. 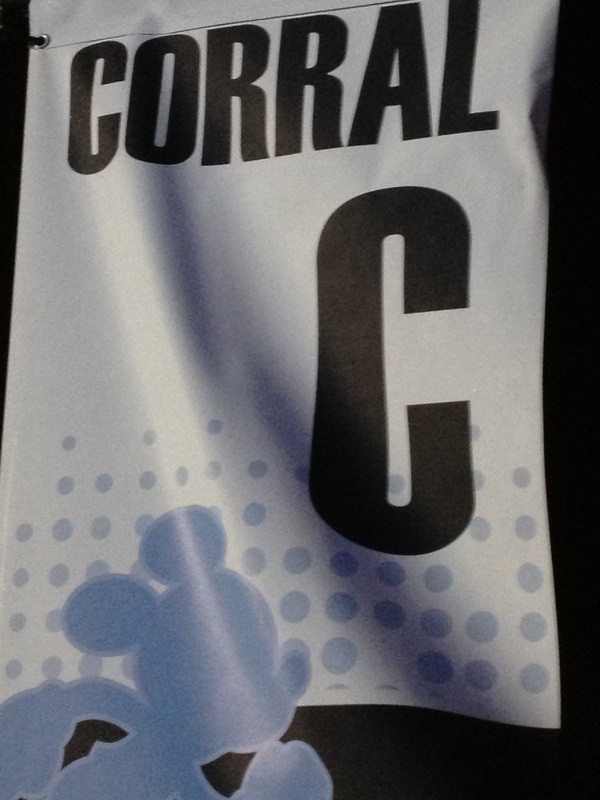 In fact, when it was almost time for our corral to start, the announcers started talking about how C was the corral with all the men. I wonder if there were men in other corrals, too? Or if just all of the faster men were there? I do feel like this race needs waaaaaaay more Tinker Bell in it. I mean, I didn't see Tink or any of the fairies out on the course. It seems like Disney could put up a "Pixie Hollow" sort of area where all of the runners are "shrunk" to pixie size, so that we could then see her and her pals. Sure, it would take some effort, but it would be such a nice idea. Maybe next year, RunDisney! That said, this course is much, much nicer than the Disneyland Half course. I like spending the first six miles basically in and around the parks -- wouldn't it be great if we could just do two loops of that? And starting the runners on the big roads, allowing us to space out a little before the parks is very smart. We started by running around the outer edges of the park -- up the "big hill" (slight incline at a freeway overpass) and then back along the edge of the park and into a backstage road I had never noticed before. (Cooool!) Then we ran behind California Adventure for a minute, before popping out into the park in Cars Land, running through there (pretty! ), around the lake, then back by the Grizzly River Rapids entrance, and then out onto the plaza. California Adventure? Main Street? Who knows? Yet again, we were met by silent crowds, all looking just for their own runners. We did our usually "hey! Give us a whoop!" sort of thing, which got them to make a little noise, but it was still weirdly quiet. I really really really need to earn some race karma some day by going out to cheer for runners I don't know! Then in to Disneyland, where we got to run up Main Street. Always great to run up there! And I think the spectators were perhaps a little more enthusiastic... 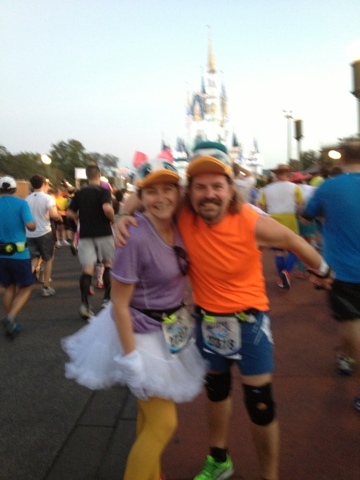 Somehow we didn't stop for a castle pic -- heck, I don't think we even remembered to take a post-race pic! -- but then runed to run through Tomorrowland before looping back around to go through the castle. It's funny to run in both the Magic Kingdom and Disneyland so close together -- because, in essence, the course is the same. In the park "backstage", the turn on to Main Street, running toward the castle, turning off for a loop through Tomorrowland and Fantasyland, then back through the castle before turning to Frontierland and then backstage across the train tracks. This time when we ran through Fantasyland, I heard the carousel operator say, "Hold tight, Lost Boys -- carousel is starting up!" -- which made me think they had needed to take a break for some reason. Still, nice to actually have characters on the carousel, as opposed to having it stopped. Of course, the minute you leave the park at mile 6, the energy drops a lot. But at least in this race, we were nearly halfway done. We ran through a surprisingly cute street of houses (so close to Disneyland! ), then out to Muzeo in downtoan Anaheim, and then back. Easy peasy. I was feeling a little tired, a little footsore; but Wil was having an awesome day. I just feel bad that I held him back! 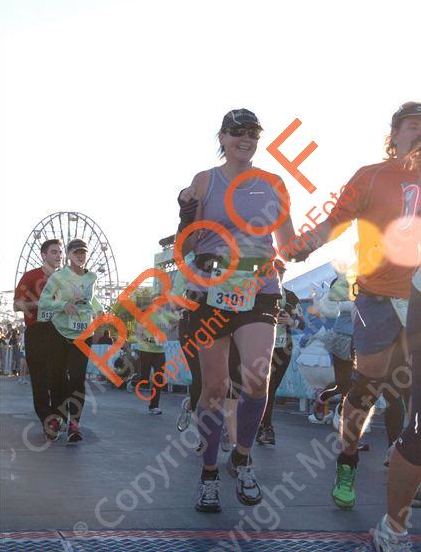 "Proof" that Wil dragged me over the finish line! I just tried to keep up with Wil -- but my feet were hurting and I was struggling. 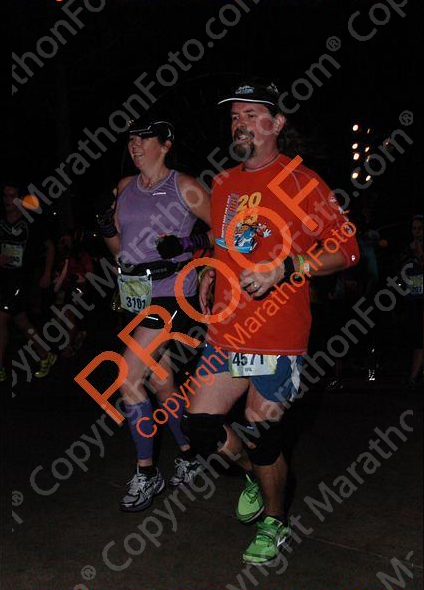 Still, in the last mile or so I felt like I was able to pick it up and we finished strong in 2:21. Not anywhere near a PR, but not bad for a Disney race -- and a race after we spend a week on our feet in Disney parks on both coasts. We got our medals, our snack boxes (different stuff inside! ), and then our Coast to Coast medals. It was so early -- not even 8am -- that we couldn't go into a park or anything, so we decided to just head back to the hotel. But along the way we stopped at the 12 mile marker and cheered for the runners still coming in. We must have stood out there for 15 minutes or so -- earning a bit of race karma, and hopefully inspiring people to finish strong. Best line? "You're so close to earning your wings!" I sort of wish I had spent more time out there, but I was tired and sweaty and desperate for a shower.... and maybe a nap. Later in the day we met up with Gretchen for a fantastic veggie lunch at the Green Door Cafe in Orange, and then went back to the parks for a little more Disney fun. The weirdest part of the day was going to the Mad T Party and watching the crowd completely enraptured by what can only be described as a wedding / covers band. Is it a fun show? Sure. Are the songs well performed? Of course. And the band plays with the kind of swagger you'd expect in a famous band. But the fact that the crowd KNOW THE CHOREOGRAPHY and SING ALONG with the band is a little weird. 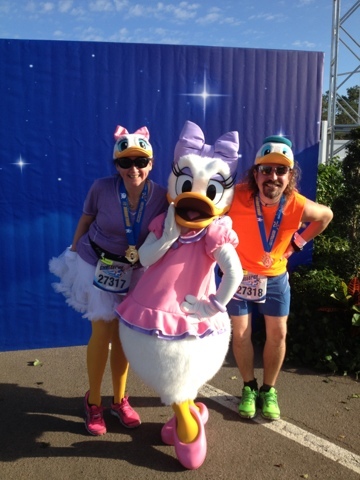 Not sure when we'll be back in Anaheim again, but we've already decided to run the Tinker Bell Half again next year -- and we're going to convince Suz that it should be her first half, too! After a great week in Orlando we flew to Anaheim on the Friday before the half. Our plane had several Goofy runners on it -- most of whom were also going to run the Tinker Bell half. Nice. Landed around 2:30, so we decided to drive straight over to the expo. 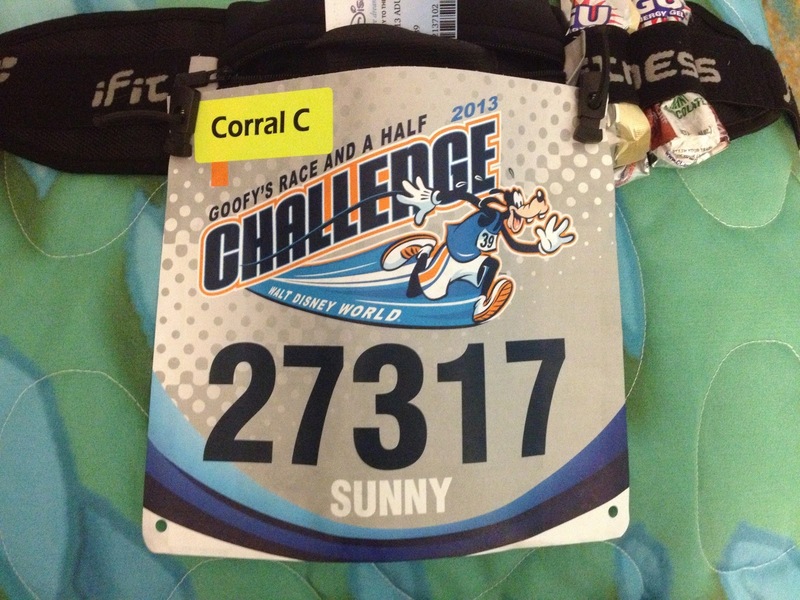 First we picked up our bibs, pre-ordered pins (just the one each), my necklace, and our Coast to Coast wristbands. (yay!) They had a cute system to check the bib tags -- they had everyone cross a set of mats while some eager and excited volunteers cheered. So Wil and I held hands and ran over the mat, which they loved. Super cute. We looked at the merch -- nothing too special. No pint glasses again -- just wine glasses. Now, I have nice wine glasses -- I don't need cheap ones with a race logo. And don't they know that plenty of women drink liquids in pints? I looked for pins, but didn't see any hanging. So after a quick look at the shirts and hats, we got in the line (of 2 people) to go to a register. We asked them about pins -- but apparently they didn't make medal pins for this race -- the only pin was the one we had preordered. A little odd, but okay. We also noticed that they had the little Vinylmation figures by the registers, so we asked if they had the tiny Tink medal. Oh, yes, they did -- in boxes behind the counter. Now, I think the Vinylmation figure and matching medals is genius. But I can't believe that they were behind the counter. Unless you had seen them in Orlando, you wouldn't know to ask about them, I think. I wonder if they sold more than 10 of them? As we were getting ready to leave, we heard them announce that Jenny was about to speak -- so we decided to sit down and hear her talk. Not too many folks in the audience (after all, it was 4:00 on a Friday afternoon) but as she talked, it filled in. We sat right up front to be supportive. Afterward we had a little chat with Jenny, and made plans to meet up for a Tiki Tiki Tiki Tiki Tiki Rum at Trader Sam's on Saturday after her last talk. We spent the rest of Friday getting groceries, settling in to the hotel, and enjoying the parks. (Despite a very uncharacteristic Disney error and some annoying runaround involving our annual passes.... still, we were in Disneyland! Saturday was much of the same in the morning, then we met up with Jenny. Trader Sam's was crowded, and we had a hard time finding places to sit. First we perched at the corner of the bar near one chair. Then we upgraded to a small tall table near the door with one chair. Then we moved over to the bar, where there were two stools, and grabbed another chair. Then, finally, we sat down at a proper table. This probably took, oh, 30 minutes... and during all that time no server approached us or offered us beverages. A little odd. We talked so long that we ordered a second round of drinks -- this time the Shrunken Zombie Head. Why? Because it's served in a shrunken zombie head souvenir glass, of course! It was a little funny watching the bar empty, fill up, and empty again while we sat and talked. An unpleasant family crowded around the small two-top next to our table essentially willing us to leave for, oh, at least a half hour. Luckily for them I didn't notice them until I stood up. Had I noticed them, I would probably have lingered longer. :) In fact, when we got up, an argument ensued between them, a small group standing with no table, and another guy who was standing by the door. As we left, Jenny offered us her extra park hopper passes, which we knew we would be able to find homes for, along with VIP wristbands for Sunday. It was great to see Jenny again -- hope we get to see her again soon. Felt surprisingly good on Sunday morning -- even if 3 a.m. came too early! Another bagel and cheese, then on the bus. This morning everything went much more smoothly - no crush in the holding pen, and very short lines for the porta potties. They also had volunteers handing out water - which they *might* have had on Saturday, but the crush was such that we couldn't see any. Also, this time they had entertainment on the walk to the corrals -- a DJ playing music, plus a miked-up Fairy Godmother chatting with runners and posing for pictures. It also seemed like there were even more porta potties on the offramp? Anyway, very smooth. The same running VIPs were briefly interviewed, along with Joey Fatone, who was running the Goofy in the place of his injured wife -- for his first marathon. He seemed happy after the half; not sure how things went for him in the full. Corral C seemed weirdly crowded -- but then again, this time we had settled down at the back of the corral rather than partway in. We recognized a few people from the day before -- also noticing some costume changes.... which reminds me that I had changed "costumes" as well: for the full I wore a blue running skirt, orange "run happy" EZ T (with the sleeves cut off -- too hot! ), and a black vest made from an old tech tee. 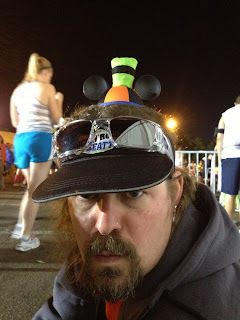 Oh, and Wil and I both wore a pair of mini Goofy ears on top of our regular running hats. Not quite as cute as the Daisy costume, but still cute. It was nice, toward the end of the race when there were more spectators, to hear "looking good, Goofies!" Again, it seemed like we didn't spend all that much time in the corral. I guess that's the 5:30 start, rather than 6:00. But I was still antsy and just wanted to start running!!! When it was our turn to start, we slowly moved to the line... and I realized I had forgotten to start my watch. Oops. Luckliy I managed to connect to a satellite pretty quickly and only "missed" the first tenth of a mile or so. We had decided to go out at our usual 4:1 intervals, stopping at every water stop to hydrate, and then reassessing things at the halfway point. I felt really relaxed and good, and ran comfortably next to Wil. The new course was a little odd. My favorite part of the previous course was running into Epcot in the dark, sweeping past Spaceship Earth and seeing the lights in the pavement. But now it seemed we just followed the standard highway route to the Ticket and Transportation Center, meaning there wasn't much to see. 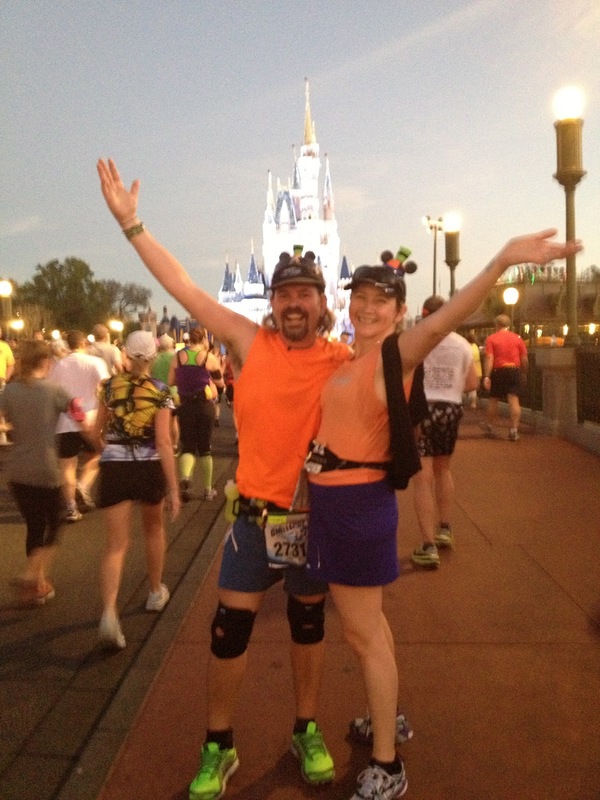 It also meant that we reached the Magic Kingdom really early in the race, rather than a third of the way through. Still, I had the same happy rush when I noticed the castle and Space Mountain for the first time, and was positively giddy when we turned on to Main Street. We took another castle pic before turning off into Tomorrowland. Because we were running, we were surrounded by far fewer people -- we *might* have even managed to be caught in one ot "those pics" -- or maybe not. But I didn't feel like I was trapped behind anyone as we came out of the castle. Then the quick spin through Frontierland, across the train tracks, and backstage -- where they had a few characters standing on a parade float. Then, sigh, back to the bland roads. But this year there was a little treat -- we ran over to the Richard Petty racetrack, down and then up a very narrow and steep tunnel that runs under the track, and then onto the track. Dozens of vintage cars were lined up around the track, with their proud owners sitting next to them. It was pretty cool to see all the cars. Of course, the most popular cars were Lightning McQueen and Tow Mater... It was surprising to see how big the racetrack was -- I think it was a mile around the oval. Much smaller than Indy, of course, but still pretty big. It was a neat way to burn up some miles. We left the track at road level -- much easier! -- and then crossed a grassy median, which made Wil say, "trail run!" which made me laugh. We then ran on some backroad for a few miles. I thought that maybe we would be able to skip the wastewater plant... Nope. But it really didn't smell this year. The had actually made little signs that were posted near the plant about the amount of water processed, the number of miles of Disney highways, and other facilities info. Somewhere along this stretch we passed Mary Poppins and Bert, but I didn't need to stop. We also passed the accordion players -- whom I LOvE -- and I think a collection of villains. Not really sure. And then I saw the sheep and knew we were close to Animal Kingdom. Now, in previous years this was cause fort great celebration -- it meant we were at mile 19 or something like that, and well on our way. This year, however, we hadn't even hit the halfway point. This was slightly depressing. But I always like the African drumming and dancing, and it still meant we were checking off another park. 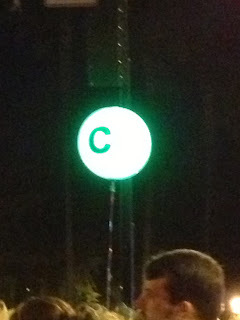 As we left the park, we crossed the half-way point. 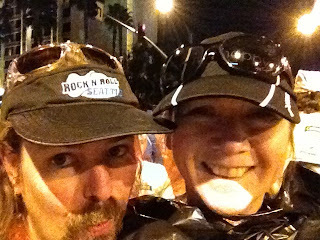 Wil and I stopped for a moment -- half marathon # 36 complete! -- but then kept on going. I had had this idea that we could walk the second half of the race. After all, it was crazy hot and I was starting to feel tired. And did I mention that I haven't run a step over 14 miles since, oh, the NYC Marathon in 2010?!? But we had made decent time, still felt okay, and decided to keep running for a while longer. After leaving the backstage area we ran across the entrance to the park -- just starting to collect visitors, and also featuring lots of spectators. Nice little energy boost there! We passed the Jammin Jungle Parade floats and puppets, and all too quickly returned to the highway. A few nice surprises awaited -- a group of gravediggers staggered menacingly along in a Haunted Mansion graveyard scene, for example -- but it was mainly just boring highway for a couple of miles. The day was getting hotter and hotter -- but plenty of water stops meant we kept pretty hydrated. Finally we got to the turnoff for Wide World of Sports. I had been dreading this a little -- it seemed like we would be twisting and turning through too many narrow paths. But in the end it was nice -- and a nice way to "explore" the area. We ran past soccer fields and baseball diamonds, on to and around a very nice running track (which made everyone go "ahhhh" because it was lovely and cushiony), past fields marked for sports I didn't recognize, past another field with a huge Mickey Mouse hot air balloon -- proper balloon, with a basket and everything -- and finally onto the main baseball diamond where the Atlanta Braves play spring training. We ran down the first-base line, past home plate and out along third, then out to the warning track where we ran most of the way around. I'm pretty sure we were on the jumbotron at some point, but it was so bright and so hot that we just kept running and didn't see. A few more twists and turns and we were on our way out of the park. At the last corner, we could see the special 20th anniversary section -- a bunch of giant puppets (probably from some parade?) lined up along the road, a stage with Mickey, Minnie, and Goofy where one could run up and have pictures taken. We also ran under a big archway decorated with images of all the race medals -- very nice. After the archway, we met up with the people just heading in to the WWoS. It was pretty astounding to see how many people were behind us -- but then again, we had been running at a decent pace. Oh, and the best part of the WWoS loop? On our way in we heard an announcer say "less than 6 miles left" -- yep, we burned up three miles in there! Nice. We passed the SportsCenter guys when we got back to Osceola Parkway, and then quickly turned off toward Hollywood Studios. 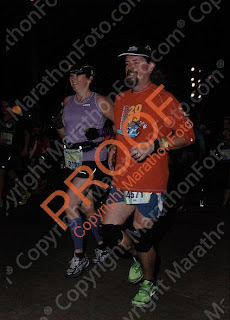 This was where I hurt my knee during the first marathon, so I took it pretty easy. The green army men from Toy Story were on the ramp, exhorting people to keep running -- telling people that they had better be running or power walking up that ramp or they would be required to drop and give him 20. It was hot, hot, hot at this point. I had been dumping water over my head and neck at every stop -- my shirt was soaked, but I'm not sure if it was water or sweat. (Ew.) But we kept going and eventually made it to the backstage entrance to the park. Somewhere along here -- ah, before the Studios -- I heard the unmistakeable sound of the start of "Sweet Caroline". I started singing... but no one else did. Not even the "bomp bomp bomp"s. Weird. I think it was just too hot and people were saving energy. Here's what's funny. At the end of the song, it just started up again. Yes, that's right, it was a "Sweet Caroline" station. Funny, that. THEN into the Studios, where they had several of the funny improv actors -- Hollywood Boulevard denizens, I guess -- chatting with each other and runners. It added a nice touch that I don't remember seeing before. Another highlight -- chocolate! I thought it wouldn't be very nice in the heat, but oh boy does a Krackle mini candy bar taste nice! We ran into the costume shop, where I was surprised to see people working. I spotted a shelf holding a dozen or so Donald Duck hats -- very cute. We passed several characters from Pixar films in the backlot -- and possibly even a glimpse of Phineas and Ferb? I think regular guests were in the park at this point, but not many -- so I didn't have any collisions. Then out of the park, past lines of tired and grumpy guests. 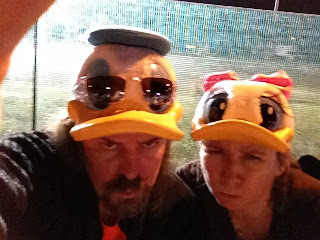 (Which makes me laugh to think about -- I bet we looked pretty tired and grumpy ourselves!!) We ran along the path next to the river, then up onto the bridge by the Swan and Dolphin. I always think that Epcot is right there -- but first you have to run around the Boardwalk. I think if I could stay anywhere, I'd stay at one of the Boardwalk resorts. They just seem cool -- and I like the entertainment district that's right there. Maybe someday! The boardwalk is, um, boarded with narrow wooden planks in a chevron pattern. Something about the wood and the lines (and the heat and the sun) made us feel woozy, so we had to drop to a walk. While we had always known we would finish the races by hook or by crook... and had realized that we were going to finish well around mile 20.... we were actually, weirdly, on a big PR pace up till then. Oh well. Doesn't make sense to try and PR in that heat! After the Boardwalk area, we arrived backstage at Epcot. I love, love, love popping out into the World Showcase right by the United Kingdom. A large crowd stood at the turn, cheering... many of them holding pints of beer. Why does no one ever offer us drinks? Then up the tiny hill to the bridge to France ("it's literally all downhill from here!) and the rest of the way around the circle. It was still early enough in the day that there weren't too many other guests and we didn't crash into anyone as we ran toward Spaceship Earth. I love the end of races when you see people really digging deep -- if they have been walking, they try to run a few steps; if they have slowed, they try to pick up a little speed. It's my favorite part -- and not just because I know I'm almost done as well! We passed the gospel choir, I got my usual wave of endorphins which made me feel weepy, and we entered the home stretch. We held hands and ran across the line. Perfect! Random race memories: car-themed music playing as we ran around the racetrack; the soccer players standing at the edge of their field at Wide World of Sports, clapping for what must have been hours; the two men in sparkly-silver shorts and matching tuxedo shirts who we ran with near the Magic Kingdom parking gates, lost for a few hours, and then caught up with just before the finish line; the woman running in a full-length Belle ballgown; the "course liar" around mile 20, saying things like "there's free beer and barbecue at the finish!" and "you're almost there" and "you smell great!". We picked up our marathon medal, were given our Goofy medal (how did they know we completed yesterday?!? 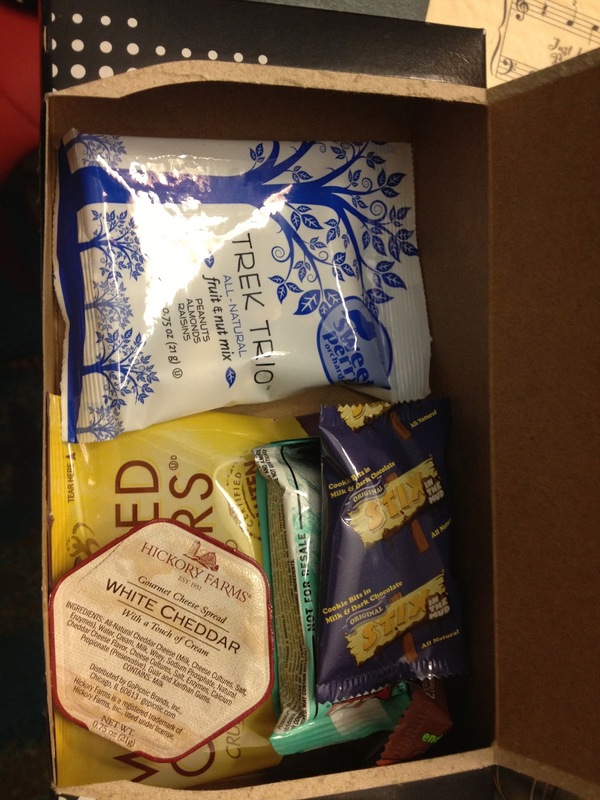 ), and our drinks, bananas, and snackbox. Nice. Oh, and today they gave us "Great and Powerful Oz" lunchbags, which made it really easy to carry the stuff. ah, yes, "PROOF" what we finished! It was really hot, we were really spent, so we didn't linger at the finish and just headed for the buses. A huge family pushed in front of us, meaning we had to wait for a third bus -- and while we were in line, a runner just keeled over. Fainted. It was a little scary, but a couple of medical folk on bikes arrived really quickly and helped cool him down. Afterward we thought that perhaps the same might have happened to us if we hadn't slowed down on the Boardwalk. We went back to the hotel and walked immediately to the pool. We stripped off our tech, our race belts, our hats, and our shoes and socks and jumped in the water. So cold, so nice! 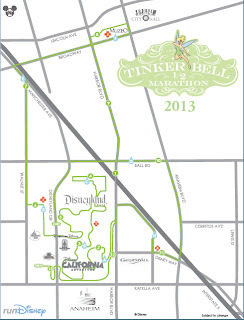 Next up: Tinker Bell Half Marathon! Wil gets his race face on before the race. 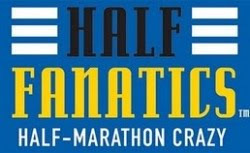 Of the 25,000 participants in the half marathon, 10,000 of them were Goofy challengers. This seems like a weirdly high proportion. But I guess it is extra revenue for Disney, so it shouldn't surprise me! So we weren't the only people in our corral to be taking it easy on the first day. Our race plan was just to walk at a relaxed pace -- one that would keep us well ahead of the sweepers of course, but not one that would hurt the next day. I was wearing my pink PureCadence, a purple EZ v-neck shirt, yellow tights, white compression shorts, and a white tutu pinned to be flat in front, full in back. Oh, and a vintage Daisy Duck hat to top it all off! Wil wore and orange shirt and blue shorts, and a vintage Donald Duck hat. We looked awesome! The race was fine - a few pinch points in the crowd, but nothing too awkward. We ran up to the ticket and transportation center before heading into the Magic Kingdom. It was still pretty dark when we ran up Main Street, and the road seemed so weirdly narrow. We think they may have not had effective covers for the trolley tracks, so didn't want anyone running on them? But they had spectators roped more than halfway across the street, leaving the runners with only a narrow chute. Still, we grabbed a cute castle pic as we headed up the street before turning right to Tomorrowland. We caught our first glimpse of the new Fantasyland, including the Beast's castle, and we swung back around to Sleeping Beauty castle. Again, no one on the carousel (Disneyland does that better) but they did have characters next to the castle and trumpeters on the balcony. Then through the castle, the usual crush of people trying to get THAT photo, and off to Frontierland. We glimpsed Tiana and a few other characters before running in front of the train (always weird) and exiting the park. The miles back to Epcot and the finish line are always a little bleak. Sure, they had marching bands and cheer squads and characters, but it is always pretty boring. The on-course support, however, was great - plenty of well stocked and well-staffed water stops all along the course. Finally we got to Epcot, made a little out and back past Spaceship Earth, past the gospel choir, and to the finish. Nice and gentle 13.1 mile, 3 hour, 5 minute walk. 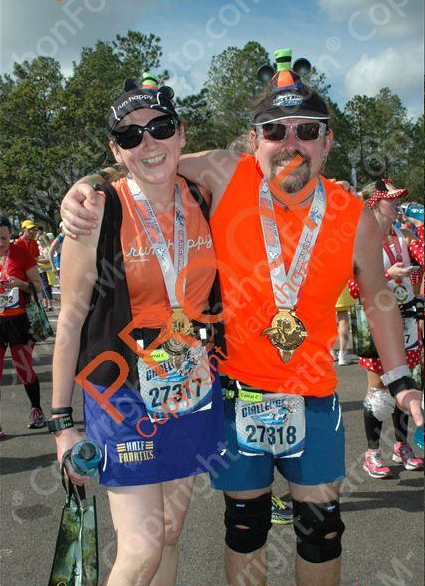 After the race, we picked up our medals (cuter in person than in pictures! ), got a bottle of water and a bottle of Powerade, and then picked up a banana and what can only be described as a snack box: a pre-packed box of treats. Simple, efficient, and no one picked up more than their share. Great! 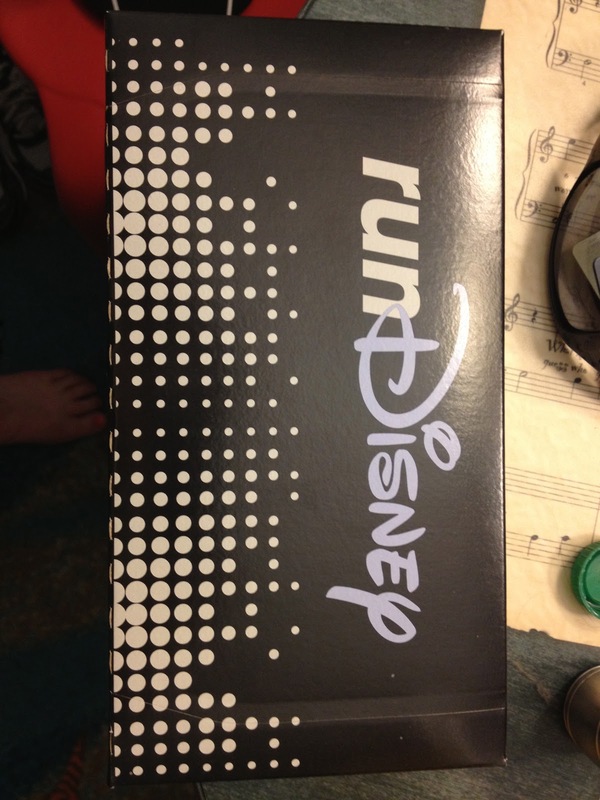 Plus, the box allowed for Run Disney branding, far fewer volunteers, and much less post-race frustration. 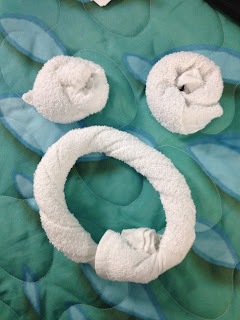 We cooled off a little, and we're then heading over to the buses when we saw that Daisy -- DAISY!!! -- was out for pictures. It was really important for me to get a picture with Daisy while in the costume, so we jumped in the line to wait. Yeah, okay, it took 15 or 20 minutes to get to the front, but it was worth it! Daisy saw me and froze, looking me up and down, pointing to me and then back to her. I did my weird little excited dance, which she did too. Then she hugged me and made lots of kissy noises. :) I know that "Daisy's friend" probably doesn't see a lot of Daisy fans, so I hope she also got a bit of a thrill. We took a bunch of pictures, and then headed for the buses - relatively efficient, though I do have that slight "participants should board before family members" feeling. At least it was a nice hot sunny day, so we weren't shivering in our race clothes waiting while families boarded. 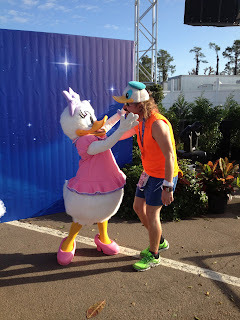 A few random memories of the race: the two women dressed in matching Donald costumes, one of whom was dawdling and chatting loudly with everyone, while the other kept shouting at her to "RUN, Donald!!!". I almost wondered if they were on-course comic relief. A woman complaining about not hearing "Sweet Caroline". Giant Mickey hands at the overpass. The poor woman the much-too-small running skirt -- I bet her post-race shower was excruciating! Seeing the first wheeler closely followed by the first male and the first female -- before we even reached the Richard Petty track.... and then wondering if those were indeed Hansons-Brooks singlets streaking past (they were!). High-fiving Donald at the finish line. And enjoying a post-race pint at the Tusker House at Animal Kingdom in the early afternoon. Bliss. Got to Orlando only a little behind schedule, but the quality time spent with the rent-a-car folks meant we wouldn't be able to make it to the race expo on Thursday night. No matter; we went to the grocery store, got checked in, and spent a little time exploring pretty Art of Animation. Thursday morning we put the top down on the Mustang (woot!) and drove over to the expo. It was a gorgeous, if possibly too warm morning. We lined up in about the same spot as last time. After the doors opened, however, Goofy challengers went to a different spot to pick up bibs. Because Wil and I had consecutive numbers on our bibs, at least we were in the same short line. (Usually Wil is in the only long line at an expo. Heaven knows why...). But we got our bibs, upgraded to Corral C based on our previous finishes, and then went to collect the merch. We picked up our pre-ordered pins and necklaces (hello, charm bracelet!) and then looked at the stuff. First priority for me was to get all of the "medal" pins -- check. Then the pint glasses. We decided to just get a pair of the Goofy glasses, rather than the full and the half as well. Then we looked at shirts. The designs were actually pretty cute this year, but nothing came in black. Besides, the last thing I need is another technical top, right? 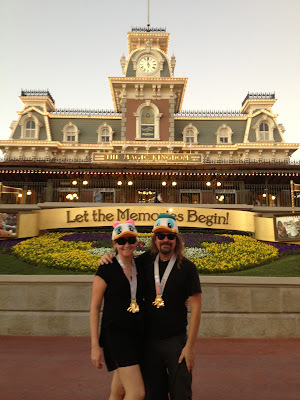 The last thing we picked up was a pair of Run Disney vinylmation figures -- along with tiny medals for the figures. 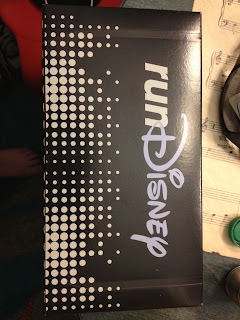 Typical marketing genius on Disney's part, here: the figures had only Run Disney and 2013 branding on them, and the box had a graphic the looked like the marathon medal, but wasn't. So they could mass-produce the figure for all of their races this year, AND sell the tiny add-on medals to go with the figures. I fully expect to see the figures and tiny Tinkerbell medals - at the expo in Anaheim. Merch secured, we then went over to pick up our shirts - three different bright colors this year, which seems nicer than the same-old white or gray. Yellow for the half, blue for the full, and orange for the Goofy. By the time we picked up the shirts and made our way back through the merch area, it was chaos... So we just pretty much walked to the exit at the expo. Easy peasy. We spent the rest of Friday hanging out in the parks, but I didn't want to go to the Magic Kingdom.. I always like seeing that for the first time during the race. So we went to Epcot first, and then over to the Animal Kingdom. But we knew that the 3 a.m. alarm was going to be painful, so we didn't stay out too late. 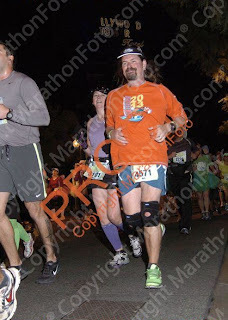 Race day was weirdly warm, even at 3 a.m., but I still put on a set of "disposable clothes" over my costume. Heck, I didn't want to fly them back home... And I figured it would still be nice to have some extra warmth on my knees in the corrals. Eventually the crush eased and we moved out to the corrals. Lots of whining about how far it was to the start (wah) and how dark it was.... But we quickly got to our corral and settled in to wait. Various running world legends were interviewed, music was played, and then fireworks were set off. 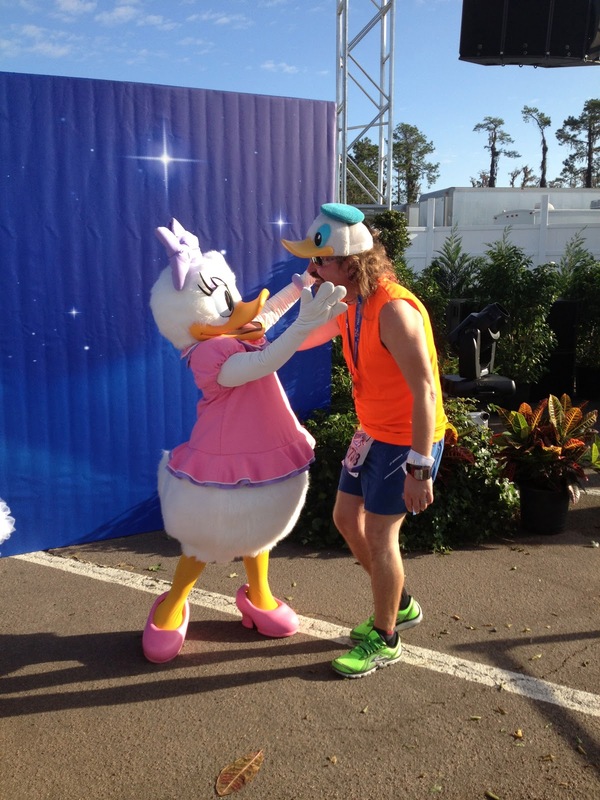 Wheelers, then elites, then corrals A and B. then the race "conducktor" (Donald, of course!) counted down the start for corral C and we took off. Interestingly, the autocorrect for "ducky" is "sucky". As we waited for our row to be called, standing in that "we are trying to stand out of the way and yet still be in position to surge forward when our row is called" sort of way, I started looking at my fellow passengers. 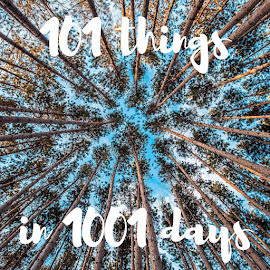 A pair of Nordic walking poles.... a pair of Vibrams... a couple of track jackets... several copies of Runner's World... and at least three Goofy shirts. Ah, yes, the traveling community of runners! One woman looked at one of the Goofy shirts and said, "you are already wearing yours -- that's not fair!" He said, "no, this is the 2011 shirt", which made her a bit chagrined. She said she was attempting her first, and was feeling a little nervous. 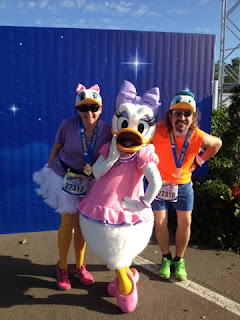 Her friend was also going to try for the Goofy, even though she had never run a full. Ballsy. Once on the plane, the chatter grew... Or perhaps, we were just more crammed in, so we could hear more folks! Lots of talk about medals, shoes, previous races, etc. I looked over at Wil and said, "it's all of my favorite things all together -- you, travel, Disney, running, runners, medals... It's awesome!!!" I spent the first couple of hours FINALLY reading John Bingham's book, "The Accidental Athlete". In turns hilarious, sad, and inspirational, I laughed out loud a couple of times... and got weepy a few others. One of my favorite pieces was his description of a motorcycle trip, and the realization during a night ride on a 2-lane highway that the only things that mattered were in the glow of his headlight. He talked about trying to remember to "live in the light". It made me think back to my Mount Rainier attempt, climbing at night up the cleaver, and only being able to see the sparks coming off the crampons of the climber ahead of me when they hit rocks, and the small circle of light cast by my headlamp. It was strangely soothing - I didn't feel too frightened when it was dark when the sun came up, it was another matter... The task seemed too great, and I was worried that I would not be able to make it down. So at one of the breaks... after watching someone take his glove off, set it down next to him, and it took off at a ridiculous speed down the side of the mountain... I decided to turn back. I sometimes wonder if more of the climb had been in the dark, I would have climbed higher. I think I could try to work on improving the time I spend "living in the light". Look, another goal for 2013! Today we're spending the day tidying the house (can't let poor Andrew live in squalor and filth! ), getting some of the packing done, and just realizing. Wil's got a terrible cold, so his job is just to get better a.s.a.p. 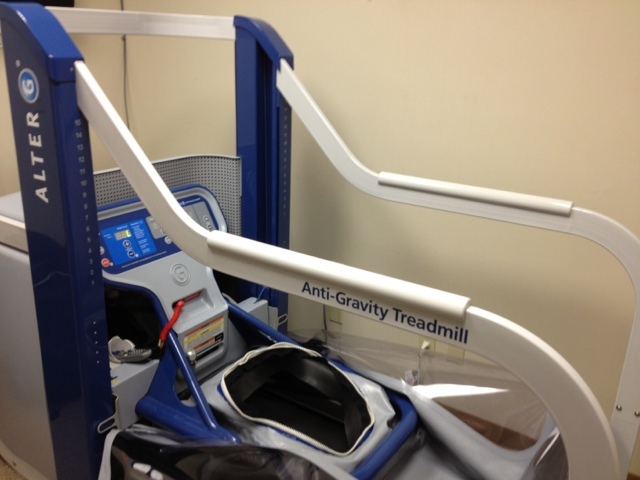 In other news, feeling no ill effects from yesterdays space-age treadmill run. Phew!